Provenance: I was born and grew up in North Bay, a town north of Toronto. How long have you lived in Vancouver? I moved here in 2000, inspired by images of British Columbia’s old growth forests. Occupations: As an impressionable young adult, I was influenced by Neon Rider, a TV show about a ranch for troubled teens, As a result, I felt I wanted to help ‘at-risk’ youth and completed a Correctional Services diploma and Parks and Forest Recreation diploma, which allowed me to become an Ontario Fire Ranger. During this time, I began visiting Vancouver during my winter breaks, and was amazed how people could walk the streets with bare legs and hands. Thus I decided to join Canada Post as a mail carrier in Vancouver. I then began organizing events, starting with my first Cupcake Throwdown in 2009, which showcased Vancouver’s amazing chefs, bakers and artisans while raising money for a good cause. To date, I have organized four Cupcake Throwdowns and four This Sandwich, This Beer Throwdowns. The money raised has gone to groups like H.A.V.E. Culinary Training Society, Aprons for Gloves, PACE, Growing Chefs and the Rainier Hotel. I also help organize Feast of Fields, which is a fundraiser for Farm Folk City Folk. Three years ago I started working weekends at Fraser Common Farm and this year I am planning to devote an entire summer there. Passions and Interests: I love bringing people together through food for a good time and a good cause. Farming and the movement to have a sustainable food system is also a big part of my life. As a soccer goalie from a young age, I have combined my love of event planning and sport to co-found the Five Star Footy Club, which raises money in order to take equipment and host soccer camps in Central American countries like Costa Rica. My interest in food sources has also led me to explore the ethics of eating meat, so I have started going on hunting expeditions. What do people know you for? For many Vancouverites I am their mail carrier, which has allowed me to meet and make many lasting relationships. People also know me for my food events and my work to bring communities together. In my soccer world I am known as a keeper. Thoughts on Vancouver? Many things have changed since I arrived here, but there is still a grassroots feistiness and activist spirit to this city. The way we are positioned between the sea and the mountains is great, too. People sometimes say that Vancouver is a cold and somewhat snobby city, but talking to strangers is one of my favourite pastimes and I constantly have beautiful, hilarious and engaging conversations. When I first met Stephanie I admired how much work she does to effect change in Vancouver. A lot of her work is directed towards helping others and I have attended some of her events, which are always a good time. 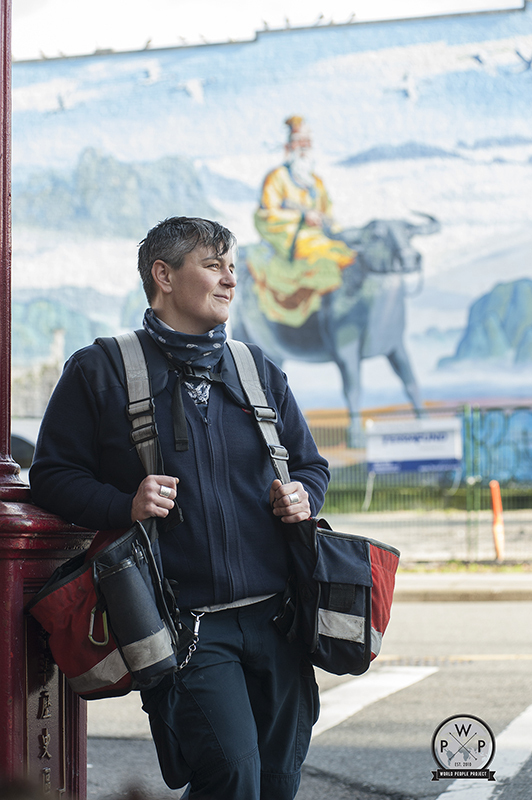 Stephanie was photographed in her mail carrier uniform, as this is how she has connected with the people of Gastown, the Downtown Eastside and Chinatown.